Two enemies with different strategic objectives in the years after World War I. The Polish Chief of State Jozef Pilsudski, obsessed with the nation's border situation and the right of self determination of the Ukrainian people. The leader of the Russian Revolution, Vladimir Lenin, fancying the expansion of the movement all the way to Germany. The game scenario drifted wildly from the historical path, but was spot on in showing how difficult is to conduct operational warfare when the troops to terrain ratio is less than 1 man per 5 square miles. White Eagle, Red Star is an excellent book about the war. Sometimes a bit heavy on the political details and a bit lacking in the maps department, but still very thorough. A shorter, 10+ pages of the war can be found in Mawdsley's The Russian Civil War. Revolution Under Siege is one of the best war games ever made with the AGEOD's engine. If you are looking for something to make you forget about the disappointing Pride of Nations, this is it. The two main areas of operations during the war were north and south the Pripyat Marshes. I am playing the Communist side and there are two "fronts" (army groups). The Southwestern Front, commanded by 27 year old (later to become legendary) Tukhachevsky. Two "armies" (judged by size they are just divisions at best) widely separated. The Ukraine Front, commanded by Egorov, is not any better in terms of strength. In real life, the areas depicted here have been the subject of continuous engagements during the years previous to the war, but the invasion of the Ukraine by the Polish is considered as the official start of the war. Such offensive operation reached Kiev almost without opposition. The Red 12th and 13th Armies abandoned their positions and moved east so fast that were spared complete destruction. In the game scenario, the Polish have not yet started their offensive in the Ukraine. Every single army at my disposal has bad or overstretched leaders. This is accounted in the game as a command penalty, which is around 35% for almost every formation at the start of the scenario. I will have to spend the first month of the war reorganizing my forces and consolidating formations. Historical hindsight is a very powerful military decision aid and I can't put myself through the thought of leaving the 12th and 13th Armies exposed in the plains of the Ukraine. I can't avoid summoning up my 12th Army to Kiev in order to put it under the command of Egorov and ordering the 13th Army southwest towards the Berezina River. Stay tuned, more is coming. Im a long time reader of your blog(i check it daily) but have never commented. 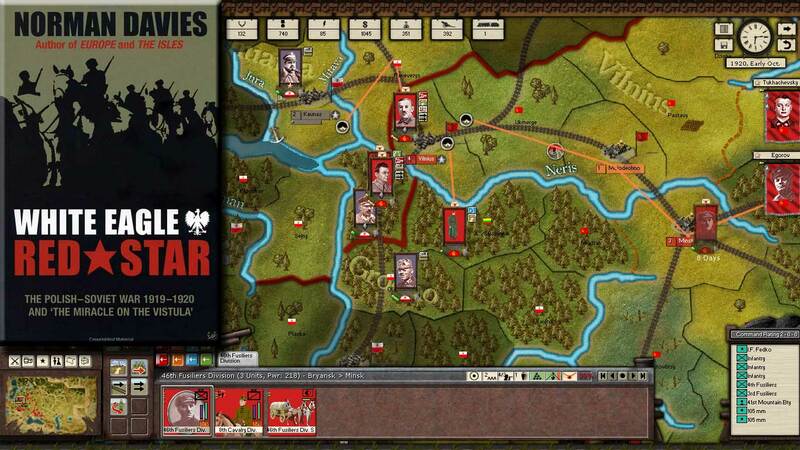 I have an interest in the Polish Soviet war and loved the book although i have yet to obtain the game. What did you find dissapointing about Pride Of Nations(i found it too complex) and how does RUS compare to Rise Of Prussia in terms of gameplay mechanics? Thanks for reading the blog daily! Pride of Nations' computer opponent disappointed me. I guess it was too much to bite for the engine. RUS is very similar to RoP in terms of game mechanics. If you played the latter, you will like RUS. Please remember that the Polish Soviet War is the only RUS scenario about that conflict. Yet it is very good! I liked Rise Of Prussia so i will probably get Revoloution Under Siege sometime soon. Are you going to post a Game vs Book for the CMSF Nasiriyah scenario soon? Ive always found this battle very fascinating and im planning to try out your custom scenario when i have time. Yes, I will. I'm just giving time to people to play it. One notic, about battle of Warsaw. To the 1920 period of war, polish historians define the scale of those "battles" as strategic. To be more specific; the actions that took place in scale of the Front in the year of 1920, were classified as strategic operations or battles. In smaller scale, both in region and strength - we have battles at army level and they were called: battles in operational scale. -battles that were involving armies of the Middle Front, in which they were conducted massive strike under the command of the Marshal Piłsusdski and his chef-of-staff gen. Rozwadowski against the Tuchaczeski West Front. On 14 February 1920, RSFRS Commissar for Foreign Affairs, Georgi Chicherin, formulated a clear directive on the upcoming Polish-Soviet decisive conflict. -Polsko-sowietskaja wojna 1919-1920 (Ranieje nie opublikowanyje dokumienty i materiały), cz. 1, Moskwa 1994. "If there will be war, it is absolutely necessary that the whole blame for it exhalation, fell to the Polish government. This is necessary, to interact in a certain way on the psychic of undecided elements in Poland, as well as on our society." [w:]Chicherin G., Ibidem., p. 46. Chicherin therefore knew, that the war cannot be avoided. On the same day in the letter prepared for Leon Trotsky, Krystian Rakowski and Joseph Stalin, Chicherin concluded that; "is no longer the politicians, but the military should decide where you will start the decisive offensive against the Polish neighbour: on the Smolensk land or Ukraine." [In:] Zapiska G.W.Cziczerina dla narkoma Trockiego, tow. Rakowskiego (kopia dla narkoma Stalina), 14 II 1920 - Ibidem., s.47-48. The words "that politicians..., but the military... decide" indirectly refer to the Szaposznikow report which was attached to the information of Supreme Commander (Gławkom) Kamenev for chairman of the Workers Defense RSFRS of 27 January 1920 [In:] Rossijskij Gławnyj Wojennyj Archiw, fond 104 - Dowodzenie Armiami Frontu Zachodniego, op. 15 uzupełniający - odtajniony 11 XI 1992, d. 58, k. 6-13. The paper was quite accurately quote in the work of Karkurin and Melikov, confirming that this text became adopted on March 10 at a meeting of the Supreme Commander Sergei Kamenev and commander of the Western Front in Smolensk, Vladimir Gittis [after him was Tuchaczewski] - offensive plan in Belarus. -strength and direction of the expected actions, but they skip overall strategic assumptions. If you want. I can go further to details on the Szaposznikow report. Wow, Marcin. That was prime material. Feel free to expand, I like the depth of your sources. Maybe I can post it as a blog entry? With your permission off course. Please be welcome to use my text on your blog. I find out that in presented game screen-shouts and your text about upcoming Polish Ukrainian campaign that took place in mid April 1920, there is a mistake about the name of one of the Bolshevik army. Not 13th army, but part of 14th [XIV] -commander Uborewicz- and all 12th army -commander Miezeninow, where situated at Ukrainian front.